For centuries, Arctic sky watchers have occasionally reported strange sounds filling the air as Northern Lights danced overhead. Hisses, crackles, and even loud "claps" have been heard and recorded. It may be time to add a new sound to the menagerie: blaster fire. Photographer Oliver Wright who was inside the Arctic Circle said: "On Christmas Night 2016, I was standing beneath an intense display of auroras in Abisko, Sweden, when I heard something that sounded like Star Wars blasters." As the lights danced overhead, a series of rat-a-tat 'swooshes' emanated from a nearby set of power lines. "Other bystanders heard it, too," he says. "I rushed closer to the power lines and was able to record a sample using my iPhone." Wright says that the sounds waxed and waned in sync with the auroras overhead; the brighter the lights, the louder the sounds, reports Spaceweather. "Aurora sounds" have long been a controversial topic. Some researchers insist that they exist only in the imagination of the listener, but there is growing evidence that they are real. The sounds Wright recorded may be a result of "electrophonic transduction"– that is, the conversion of electromagnetic energy into mechanical motion. At the time of the Christmas aurora outburst, magnetic fields around Abisko were seething with activity. Physics 101: Unsettled magnetic fields can cause currents to flow in power lines. Strong low-frequency currents can literally shake objects, launching acoustic vibrations into the air. Wright may have recorded the unique sound of those power lines swaying in response to the magnetic storm? To listen to the sound, click on the image below or click HERE – and don’t forget to turn up the volume. 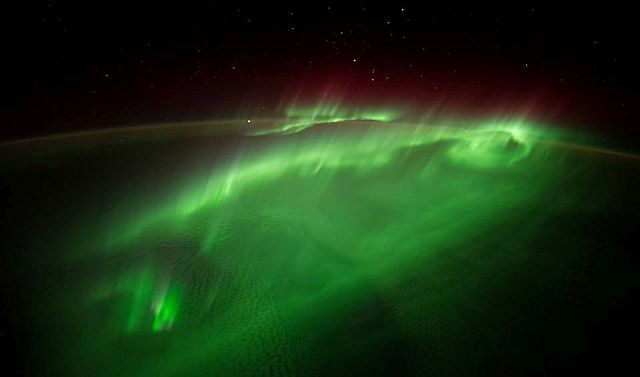 By: Spaceweather - Credit Rare Aurora Sounds: Oliver Wright. ( https://clyp.it/urzipw02 ).